It was recently reported that Roundup (Monsanto's glyphosate herbicide that conventional crop farmers use to keep their fields free of weeds) is being found in peoples' urine, in the groundwater, and in the food supply. 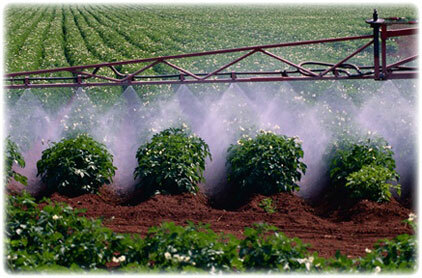 Not surprising --- millions of pounds of the chemical are sprayed on fields in North America --- each year. Lower mainland conventional farmers regularly drench their crops in chemicals. Recent data from the USGS found that Roundup is everywhere --- it's in the streams, in the air, and in the rain. You can ingest Roundup just by breathing. In the lower mainland of BC, where we live, Roundup is used with abandon on conventional farms. It's not the only chemical they use of course --- it's just one of many. According to Reuters, retired Purdue University professor Don Huber warns that tests show glyphosate "could be contributing to spontaneous abortions and infertility in pigs, cattle and other livestock." But that's just the tip of the iceberg. What about humans? According to Dr. Joseph Mercola, glyphosate is suspected of causing genetic damage, infertility and cancer. If you've ever been around conventional farms when they spray, it's quite something. The farmers get dressed in their hazmat suits before they apply the herbicides and pesticides, even though the chemicals are "safe". Often they do it at night or dusk. Doing it during the daylight puts them in the spotlight --- you can see the overspray as it contaminates all the neighboring farms. 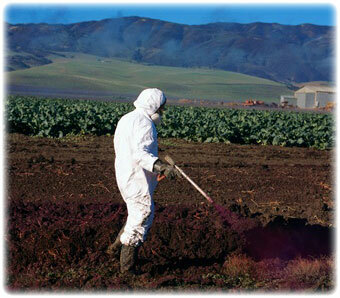 Conventional farmers must dress in hazmat suits to spray "safe" chemicals on their crops. Bottom line: it's everywhere. And since it's in the water and the air, it must be contaminating at least some of BC's organic crops too. What's the solution? For us personally, our farm is on the top of a mountain, more than a thousand feet above the rest of Abbotsford. We are miles away from any conventional farms. Our water comes from a private source on our own property, way up on the mountain, not from the city or any source which could possibly be contaminated by runoff. We are quite isolated, environmentally --- that means we are far away from the conventional "farms" which drench their fields in chemicals. And, we grow a large portion of our own food. I realize it would be nice if everyone could do that, but obviously most people are not able to. As for the foods which we can't grow, we try to purchase as much as we can from local, organic farmers who we know and trust. What are their water sources? Are there conventional (i.e. chemical) farms on their borders? Are they a small farm run by an actual family? To us, all these things matter. The chemical companies (like Monsanto) work hand-in-glove with all levels of civil government. The municipal, provincial and federal governments will not protect us. The large agribusinesses, industry marketing boards, and yes even the individual conventional farmers, all have an incentive to keep spraying. The only way it will stop is if citizens refuse to buy their produce. Each food dollar that goes to organic, local farmers (who you know and trust) helps build healthier families, healthier communities, and a healthier planet.